Oh hey, guys. So you know I wrote another book? It’s totally true. I WROTE ANOTHER BOOK AND PEOPLE ARE SELLING IT! This is my second book so you may be asking “What else do you have to say, April? No, really?” Well, it’s interesting because I find myself picking up my own copy of this new book several times a week. Not because I’m checking for mistakes. (Oops! Be sure to add 1 cup of milk to that Parmesan Popover recipe, you guys!) But because I wrote 100 freaking recipes and I need to remind myself what I can make for dinner. The Gluten-Free Cheat Sheet: Go G-Free in 30 Days or Less is super useful. Not that my first book was not. That book was ridiculously useful, especially when you were looking for curse words to describe your current gluten-free situation. But The GFCS is all about living your life day to day and trying to manage your meals. I’ll be honest, working up 100 recipes was not easy. I was cooking like a gd maniac last year, and I even hired a super duper recipe developer to help me when I was like, “I just cannot get this granola right. I cannot.” The result being, 100 amazing recipes that you’ll want to use when you just cannot order from the vegan/raw take out place for one more night. Here’s the even better news: Next week I’m going to be giving out free books!!! Every day next week I’m going to have a different question for you guys to answer, the best answer wins! It’s kind of like Cards Against Humanity except I’m not so much on the Nazis or child murder. Oh no, I just said both of those things and would like neither to be associated with this book! Please ignore. My fave up in Portland, Powell’s Books. Shop local indie, and find it up in Indiebound. Damn, I love those local joints. The B & N, for sures. Books-A-Million has got it GOING ON. Or, just stay tuned because next week it’s going to be 5 Days of Giveaways!!! Right here, this blog. This gal. Check back in, peeps. Tags: giveaway, gluten free recipes, gluten-free cheat sheet. Bookmark the permalink. Thank you so much, and nice meeting YOU ladies. This isn’t coming in hardback. It’s all paper, all the time. It’s like this tiny little book with tons of recipes. All paperback? That’s even better, no need to wait patiently while everyone else has all the fun! I’m gonna dive face first into those recipes. We’ve been needing something to spice up our food life around here! 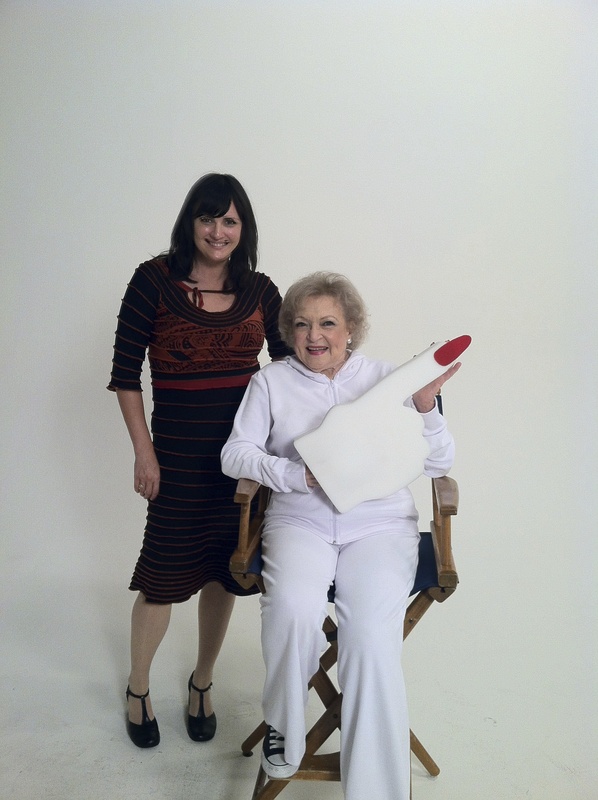 April: Did you meet Betty White? That is so cool! Is she celiac? Not celiac! My husband was working with her and I snuck in at picture time. She’s freaking adorable. As you can see. Oh, and I love your first book. It was a huge support for me right after diagnosis. You really helped me get through some dark days. Second book, here I come! Congrats April!!! I can’t wait to get my face in your book as we are in quite a recipe rut around here 🙂 And love the pic with BW!